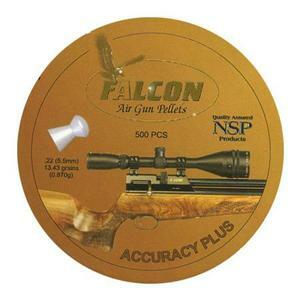 Falcon Accuracy Plus Domed Pellets. Fantastic pellets. Very accurate and always consistent. I have an Air Arms S400 and these pellets are the Bees Knees in this rifle. Quality pellets that my rifle seems to like. These are brilliant pellets. Suited my Weihrauch .22 barrel when other more expensive brands didnt.Better than JSB. You will lose a little in ftlb but the speef and flat trajectory of these pellets will not disappoint. One of my pellets of choice.45 yards sub 5 pence piece groups is not by any means out of the question. An excellent quality pellet that my rifle seams to like! Excellent good quality pellets the my rifle loves! Great product great pricenot run a full test yet . Always good customer service from Uttings. Bought 3 tins of these Falcon pellets in .22 and checked the tins for any pellet damage. There was some, maybe no more than 50 in each but you can reshape them with the end of a bic biro pen cover. Just a little time is needed, but it's worth it as my Daystate Regal loves them. Would be happy to buy them next time. If your gun likes them you will like them. Not many pellets are under weight. Falcon were certainly not over stating the name of these .22 pellets by naming them Accuracy Plus.&nbsp;They shoot superb in my HW95k.&nbsp;The skirts are easy to damage though, so you will need to take care how you store them when out &amp; about.&nbsp;I received them well protected packed in bubble wrap and only 6 pellets had badly damaged skirts in the whole 500. The best pellet I have found for my Stoeger X20S .22 springer, grouping at less than 1/2 inch at 20 yards.&nbsp;Second only to the H&amp;N Field Target Trophy in my Hatsan AT44-X10 .22 Only 2mm C-C 5 shot spread at 10 yards (indoor range). H&amp;N was pellet on pellet. Just used a 50 pellet sample pack,superb in my AA 410 carbine.very accurate and hard hitting with them probably being only 13.6 g.Just ordered two 500 tins. Pellets are softer than RWS I am using, good groupings and accurate through AA S200. Consistent at muzzle with only 6fps difference being recorded. Superb pellets that are supremely accurate out to 50 yards - just edging out the Crosman Premier Ultra Magnums as my pellet of choice...not much in it though! these pellets r very good I use them in my weihrauch hw90 gas ram and the grouping at 50 yards is out off this world I wouldn't use any other pellet barr falcons I would recommend them to my friends. The skirts of these pellets are very soft and easily deform. But that's the point of them. A high pressure blast of air up their backsides pushes the skirt out to the barrel and seals it superbly. Test. cheap block of butter 90p. Take an out of round skirted pellet, shoot it into the butter block end on , and then retrieve. Result, perfect pellet no deformed skirt. Simples. The first tin of these I had I thought were great in my BSA SuperSport and HW77 producing good grouping and flatter trajectories. Ordered 5 tins and was very disappointed at the high percentage of deformed skirts. Good ones are still consistent but far too many need to be reformed before they are usable. I'm not likely to reorder which is a shame as I thought they were going to be my pellet of choice after the first tin. Only ever used Falcons in all my .22's and all but one in my .177's. Superb pellets. these pellets are superb through my AAs200 with half inch groups at 40 yards.as they are so light they give a flatter trajectory out to 50 in .22! Shot through an AGS-PCR 1, off a bipod, these pellets are fantastically accurate - literally pellet on pellet at 22 metres. I ended up with a single lump of lead! Their downside is that they are VERY soft:- No good if you keep them in your pocket- and quite a high proportion in each new tin are deformed.